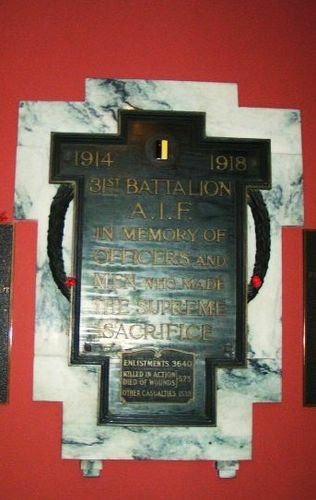 A tablet commemorates the members of the 31st Infantry Battalion who died in service or were killed in action in World War One. At the Battalion's reunion on the 11th August 1933, Colonel Toll told the gathering that the proposed memorial tablet would be ready for the unveiling by the Governor on Anzac Day 1934. The Brisbane Courier, 12th August 1933. The Battalion was raised as part of the 8th Brigade at Enogerra, on the outskirts of Brisbane, in August 1915. Some of the battalion’s companies, however, were also raised at Broadmeadows Camp in Victoria. In early October, these two elements were united at Broadmeadows, and the battalion sailed from Melbourne the following month. The 31st Battalion fought its first major battle at Fromelles on 19 July 1916, having only entered the front-line trenches 3 days previously. The attack was a disastrous introduction to battle for the 31st - it suffered 572 casualties, over half of its strength.